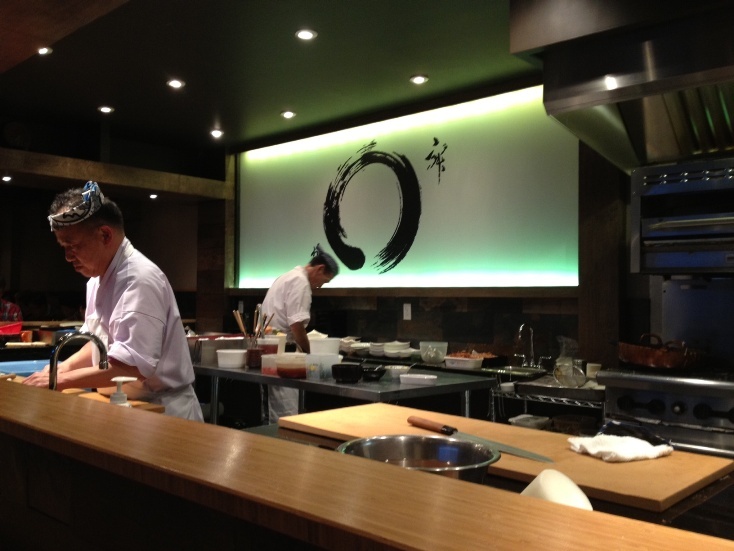 Known as one of the best sushi restaurants in the GTA, I was beyond excited to try Sushi Kaji. 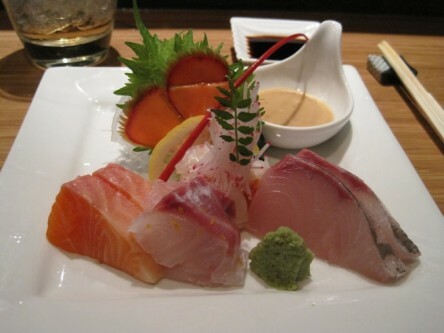 Located in Etobicoke on the Queensway, you would never expect one of the best sushi restaurants to be located in a sketchy-looking plaza in the area. The restaurant is centred around a large sushi bar. If you’re looking for a romantic and intimate evening, this probably isn’t the place to go. But this is the place to go for a great dining experience. Mike and I had reserved a spot at the sushi bar so we could watch the sushi chefs work their magic. I highly recommend sitting at the bar as it really added to the whole experience. 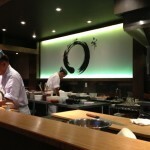 Given that they only serve Omakase tasting menus, Mike and I saved this place for a special occasion. 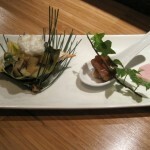 They have two options – either the Waza menu for $100 or the Takumi for $120. Since we probably wouldn’t be back for a while, we decided to splurge and go for the Takumi. 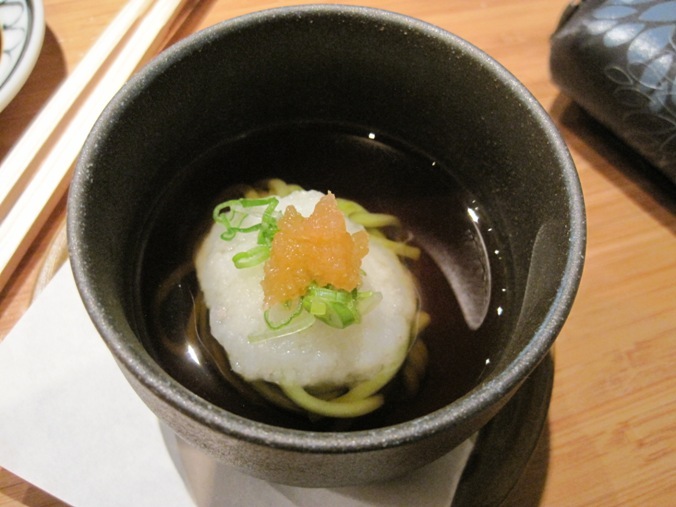 The Takumi Omakase menu started with the Daikon Radish Cake – stuffed with braised pork belly. 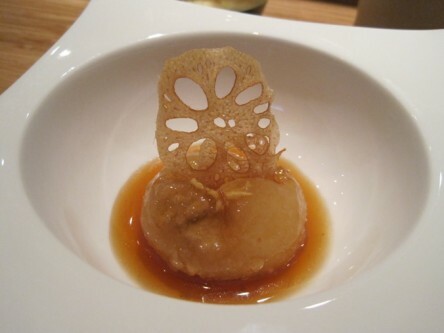 The “cake” was served warm with a small slice of Chinese lotus root on top. 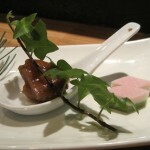 It was soft in texture and had a sweet and savoury element to it. It was a nice way to start off the meal. 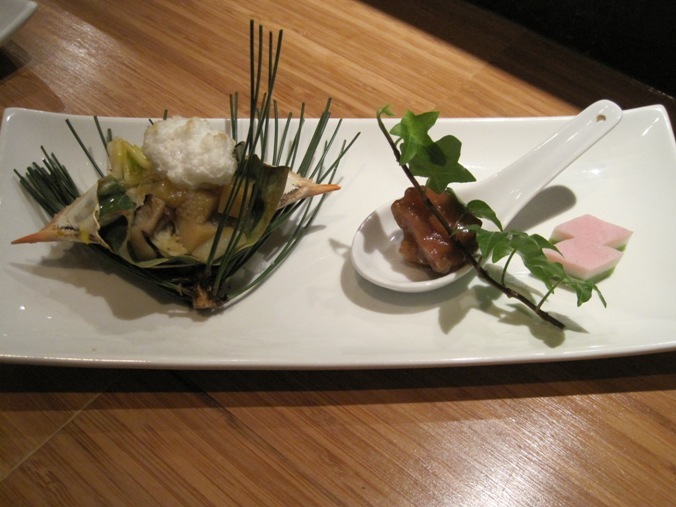 Next up was a trio of appetizers. 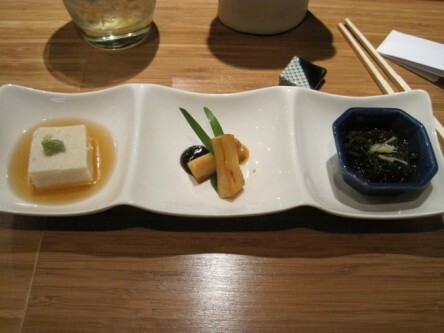 On the left was the Sesame Tofu which they make in-house. The texture of it was unlike the silky smooth variety I usually pick up from the grocery store. It had a grainier texture to it. The item in the centre was Grilled Bamboo Shoots – with 3 kinds of sauce. I couldn’t quite differentiate between the 3 different sauces but one of them reminded me of hoisin. This was my favourite of the three items on the plate. 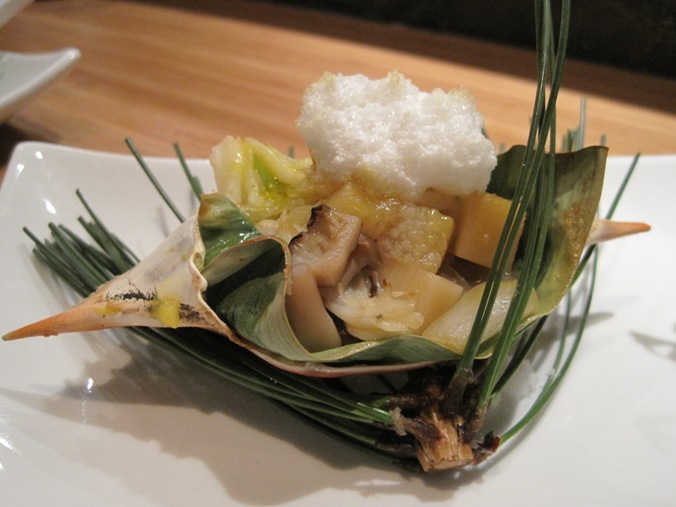 I feel like grilling the bamboo shoots really brought out the bamboo flavour. The item on the right was the Noodles topped with ginger. I didn’t really enjoy this dish as I found the noodles to be too mushy. 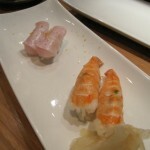 Next up was the Fluke and Trout Sashimi – with a plum soy sauce. 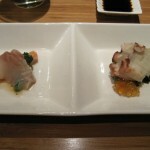 The sashimi was served with a small bite of Chinese broccoli and the trout sashimi was absolutely heavenly! Served on the same dish was Octopus – with melon jelly, cucumber and seaweed. 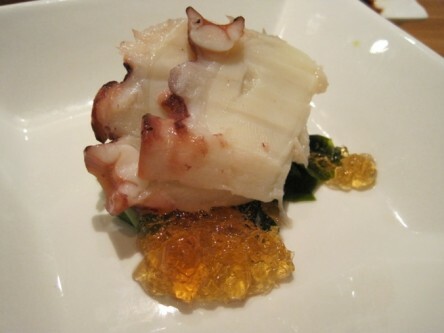 I’m not typically a big fan of octopus but the combination of all the flavours worked together perfectly. 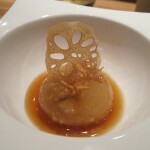 The melon jelly was absolutely delicious and added a bit of oomph to the bite. After the sashimi, the Taro and Lily Bulb Manju arrived. It was similar in texture to the daikon radish cake, the first dish we had tried. 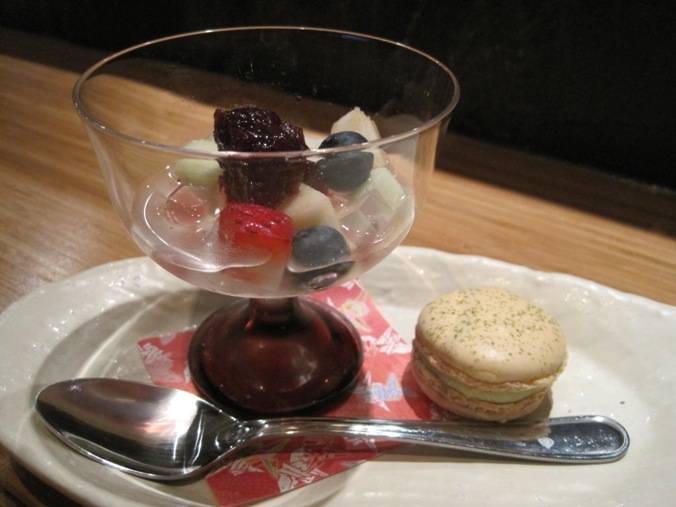 The Manju was a little crispy on the outside with a sweet, chewy interior, topped with an edible flower. 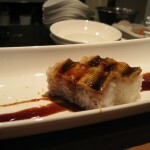 Next up was the Sea Eel Tempura. 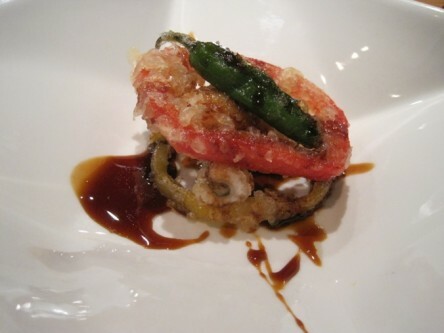 It also came with a slice of red and yellow pepper tempura as well as a Japanese pepper. 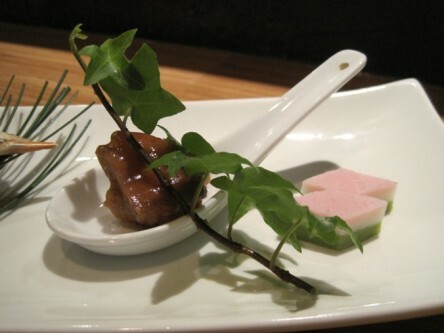 The Japanese pepper was small and resembled a jalapeno. It just shouted spicy. But despite its appearance, it wasn’t spicy at all. 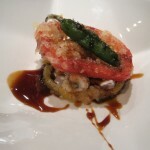 The tempura was delightful. 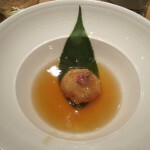 I loved that it was lightly battered as I hate tempura which has a high batter to filling ratio. 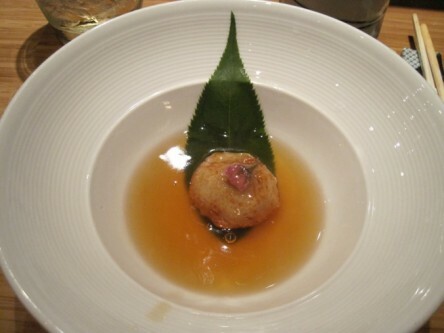 They don’t provide you with the bowl of sauce typically served with tempura. Instead, they provided a little bit of sauce at the bottom of the bowl. After the tempura, we were served the Crab – with egg yolk sauce grilled in the shell. 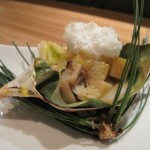 This was a nice, refreshing dish which came with fluffy egg whites, onions, mushrooms and bamboo. There wasn’t much sauce to it which really let the flavours of each ingredient shine. The same plate had a spoon filled with fried duck and a side of fish cakes. I thought the fried duck was a little chewy but enjoyed the colourful fish cakes. The menu had indicated that sushi would be served next. The first plate they served was the Eel Box Sushi. 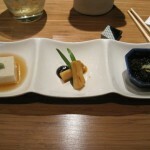 I love eel and this was no exception. 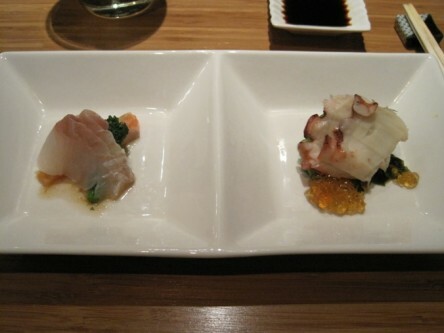 Initially, I was shocked when the plate was served since it had only come with two pieces of sushi. Was this it? Little did I know, they’d be serving us many more plates. 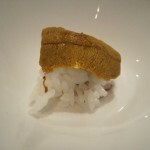 After the eel, we were served Uni Sushi. 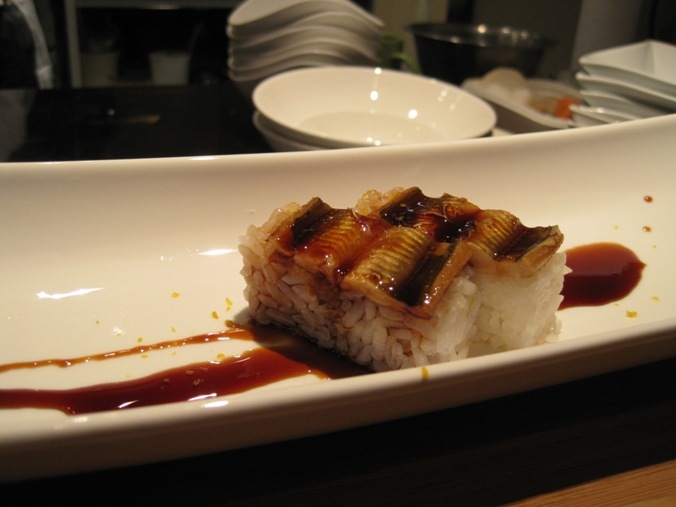 It’s as if they knew eel and uni are some of my favourites. 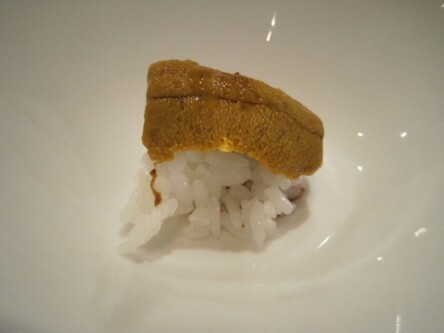 Uni has a very rich texture and a very distinct flavour which isn’t for everyone but those who enjoy it, reeeally enjoy it. The next plate came with Salmon Belly & Toro Sushi. Incredibly fresh and buttery smooth in texture. I was in heaven! Need I say more? 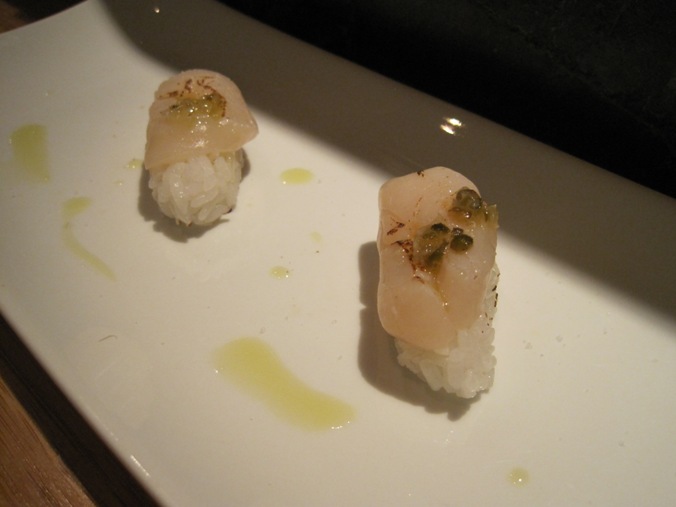 For something a little different, we were also served Scallop Sushi which was topped with Japanese peppercorn. 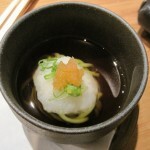 I prefer scallops raw so it’s always a treat when I have scallop sashimi/sushi. 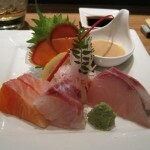 Like the rest of the fish served at Sushi Kaji, this was fresh and delicious. The sushi just kept coming! 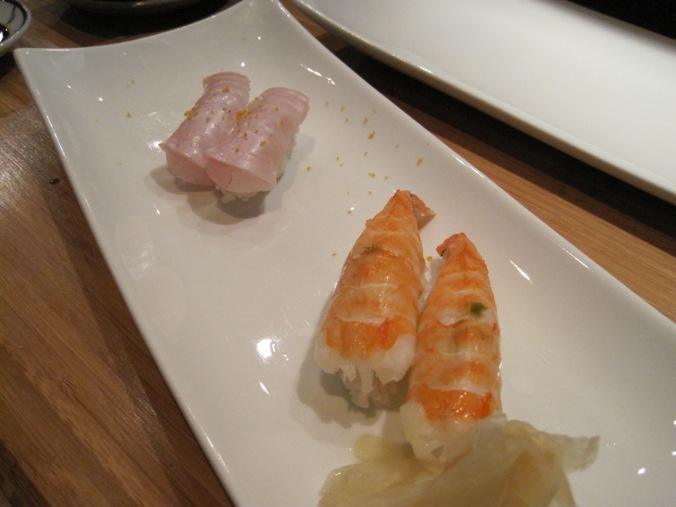 What we thought was the final plate consisted of Fluke & Shrimp Sushi. 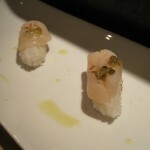 The fluke had a bit of citrus zest on it which added a refreshing note to the sushi. The shrimp sushi was… well shrimp sushi. Nothing memorable. 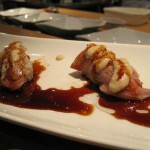 Lastly, we were served Seared Toro Sushi. 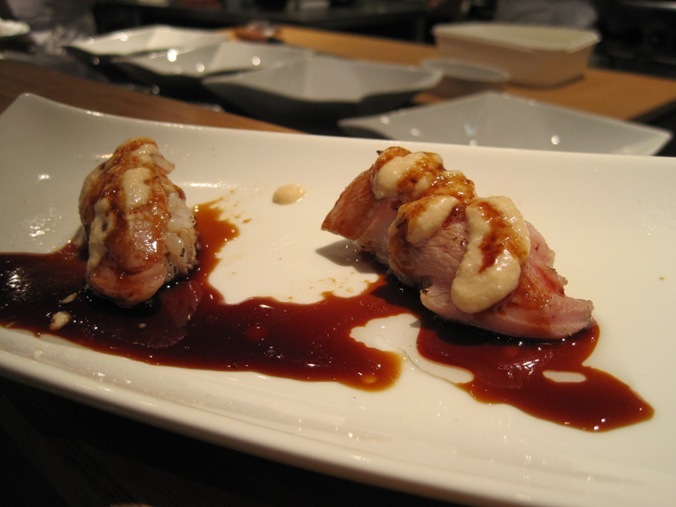 The toro was lightly seared and was covered in a sweet sauce. This was incredible. 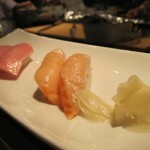 Toro has this rich, buttery texture to it which leaves me feeling a little guilty eating it. I was stuffed after the sushi but we still had a few dishes to go. 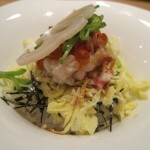 Next up was a mini bowl of Chirashi, which was absolutely delicious. 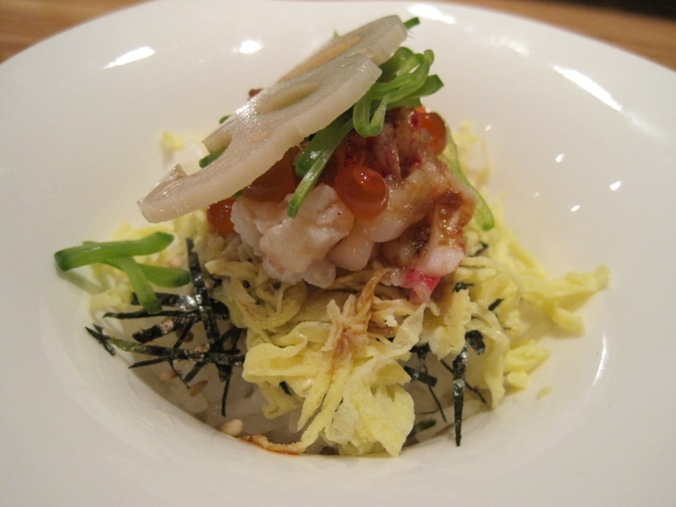 Containing egg, lobster, seaweed, large fish roe and topped with seaweed and green onions, I enjoyed every bite of this. Served with the chirashi was a small bowl of Soba Noodles in a light broth with mountain potato. This wasn’t anything special, in my opinion and found the noodles to be cooked a little more than I would have preferred. At this point, we were nearing the end of our epic meal. Too bad it ended on such a low note. We were both served different desserts. Mine was a sad-looking bowl of fruit and jelly. 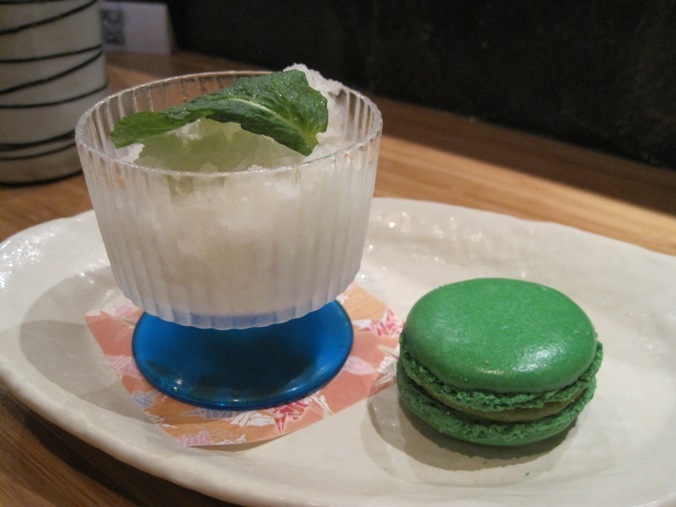 It also came with a wasabi macaron which didn’t taste good at all – very dense, chewy and cold. Mike’s dessert fared a bit better. He was served a cup of refreshing pear sherbert which was a nice way to end an enormous meal. 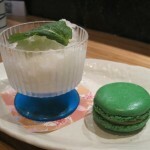 His dessert came with a green tea macaron, which had a nice green tea flavour but was just as dense, chewy and cold as the one I was served. 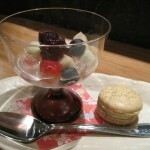 Despite ending on a low note with the mediocre desserts, we still had a great experience. The fresh fish was definitely the highlight as the meal as some of the cooked food wasn’t quite as spectacular. 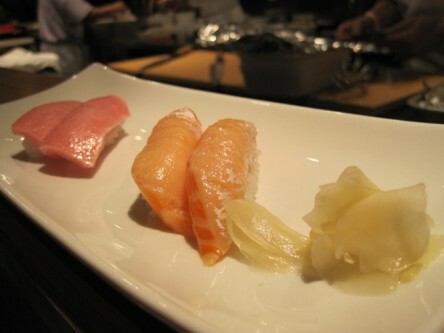 While a meal here comes at a high price tag, I feel like it’s something sushi-lovers should try once! This sketchy looking area that kaji is located in is one of the most sought after neighborhoods in Etobicoke. The homes, consisting of mostly two bedroom bungalows will run you anywhere from 450-600 thousand. Sorry I offended you but I was actually describing the “sketchy” looking plaza, not the neighborhood itself.